Tenth Planet seemed to come up with the undiscovered goods on a regular basis during the 90s and it was one of those labels that gained respect from vinyl collectors with their handsome releases in gatefold sleeves with choice unseen photos and rare music (mostly from acetates) in sparkling sound quality. 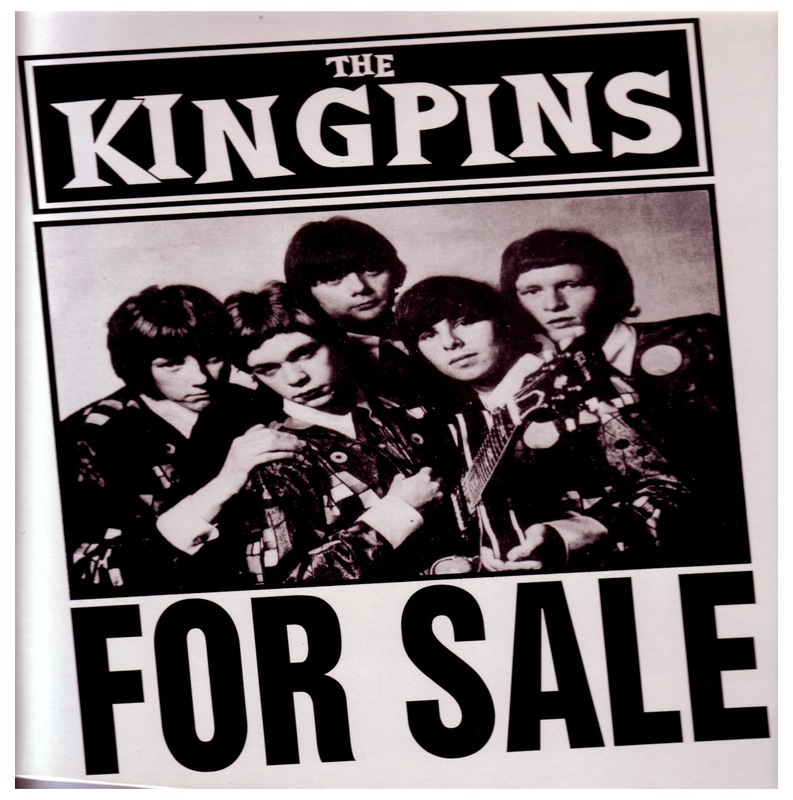 The Kingpins "For Sale" was one of their earliest releases from 1995 and was limited to 600 copies. They're long gone now but the collection may show up on eBay now and again, but with a premium price of course. I want to concentrate on The Kingpins 1965 recordings. There were two. The ravin' "Diamond Girl" and a potent version of "For Your Love." But the album also covers their unreleased songs from 1966 through to 1969 when they experienced line-up changes and group names to Those Fadin' Colours and The Orange Seaweed. The Kingpins formed in 1964 in the small town of Adlington, part of the borough of Croydon. The ages of the members ranged from 14 to 17 years old. In other words they were a schoolboy combo. By mid 1965, The Kingpins had progressed enough to enter a local beat group competition. One of the contest's adjudicators was Ronald Jones, owner of R.G. Jones recording studio and Oak custom label in Morden. He agreed free recording time for the top three acts. The Kingpins finished third. The entered R.G. Studio on 31/05/65 to cut "Diamond Girl" and "For Your Love" which were pressed up as an acetate. "Diamond Girl" was written by Tony Martin and is a hard driving beat number turning positively freak. In my opinion an absolute classic beat punk raver '65 style. "You're My Girl" is one of the great lost tracks of the 60s. Only ever released on an acetate, it features the vocals of a 17 year old Ray Neale. It's quite amazing, and when you think he's playing lead guitar and wrote it as well, it kinda blows you away. The flip side features Tony Martin on vocals and is also a great bit of song crafting. Ray's brother Keith was also in the band and played bass. Hi, thank you, this was lovely to read. I am Ray Neale's daughter Mel. I miss him every day but like you say, his music will live on! I am trying to find as many stories/any information/photographs from the good old days. I always loved him telling me his random and funny stories. Melanie - try and find a copy of The Kingpins LP on Tenth Planet. If you create a Kingpins Facebook page let me know and I'll pass the link on etc.